Chosen as one of the Independent's 9 best healthy cookbooks for 2019. 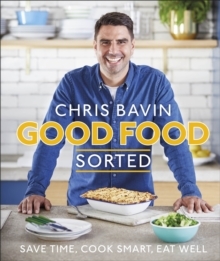 Chris Bavin is the much-loved TV presenter and award-winning ingredients expert from the BBC's Eat Well for Less? and Britain's Best Home Cook. A resourceful home cook, he uses his freezer efficiently, makes the most of leftovers and prides himself on producing healthy food fast for his young family. In this, his first solo cookbook, he shares over 100 of his favourite recipes (almost every one with a photo) and sets out his approach to no-fuss home cooking - get organised, plan ahead and save time. Pick up advice on savvy shopping, and learn how to use the freezer well, stock up the store-cupboard, and batch cook favourite family recipes. Be inspired by Chris's ideas for freezing flavours - try herb-and-oil ice cubes or frozen flavoured butters. And follow his nifty solutions to transform today's dinner into tomorrow's lunch, or use up half a forgotten courgette or fruit on the turn, so nothing is wasted. As an award-winning former grocer, Chris knows his ingredients: his flavour swap suggestions breathe new life into old favourites, and simple but imaginative ideas to "pimp up" meals turn easy weeknight dinners into weekend winners. Inspiring, yet down to earth, easy to navigate, and refreshingly practical, Good Food, Sorted is the kitchen companion for time-pressed cooks who want to put healthy, wholesome food on the table every day, without resorting to tins. Highlight recipes include quick spicy sausage ragu, posh fish finger sandwiches and vegan chilli.